The other day I was having lunch with three friends, including my two flatmates. They decided to write a 'To do' list for me with all the baked goods they desire on a napkin. They're so cute. There were two capitalised entries - Treacle Tart and these biscuits. Several of the things on the list have already been made - see Chocolate Cheesecake, Cinnamon Rolls - but the others are all things you can expect to see fairly soon. Any other requests? And so here they are - Emma Biscuits. I've tried to make them for this blog several times but never got the photographs right - and I usually only make one flavour. This time I went a bit mental and did all three variations I use. There's the dark brooding cocoa one, the mellow and unusual hot chocolate one, and then the plain - but still quite stunning in its simplicity - vanilla. This is a family recipe, scribbled in my 7 yr old hand in the notes section of my mum's copy of Delia's Book of Cakes. It also has a big cat sticker stuck on the back, dating from the same period. They're definitely one of the things I clearly remember making throughout my childhood. I also remember eating the majority of a half-dough mix multiple times - it just tastes so good. Oops. I've noticed that it bears a lot of resemblance to Nigella's recipe for Granny Boyd's Biscuits in Domestic Goddess. Perhaps Granny Boyd and my Granny got together to create them! Preheat the oven to 170C. Cream the butter and sugar together. Split into three. Whizz one third with 100g of the flour and the dark cocoa until it comes together - it won't seem like it will, but don't worry. Form into small balls with your hands and place on a greased baking sheet with a bit of space. Use a fork to squish each ball. Put into the oven for about 10-15 minutes - the cocoa ones won't really change colour, but should be slightly firm to the touch. Remove to a wire rack to cool. Repeat with the next third with the hot chocolate powder and another 100g of flour, then with the final third and the remaining flour and vanilla. Makes about 50 or so. Your friends are so funny. What a great list of things to make. These biscuits are so cute. I love the 3 different versions too. The fork imprints remind me of cookies I used to make with my grandmother! THey were peanut butter ones but I will definitely be trying these. DO you use powdered vanilla or liquid? Anf is golden castor sugar any different than regular white (haven't seen golden in Canada)? Thanks Helen - they are very sweet! ceecee- Sorry, I typed the recipe out without the' extract' for the vanilla - will add it now. Golden caster sugar is just slightly less refined caster sugar, normal will be totally fine! Looks like your friends have some work cut out for you. I love that. Great variety in your cookies. Awesome. You've just solved my problem on what other kind of biscuit to make with choc chip for a supper next weekend. I made these last night and your recipe is perfect. My kids and husband eat them all up as they came out of the oven! Do you have any tips on how to get them to look so perfect? When I flattened them with the fork, the edges split. Your's are so perfect and beautiful! I'm so pleased you enjoyed them! As far as tips go, maybe try heating the fork in a cup of hot/boiling water? That sometimes helps. Mine do crack at the edges too - maybe if you form discs rather than balls then imprint with a fork it wouldn't crack? Thank you! I will try the hot water trick next time I make them. I just got done making these. They are too cute. I forgot to put in the vanilla though so i mixed it in with a little sugar and rolled the cookies in the vanilla sugar before baking. They came out with a sweet little crunch on top. Great recipe! Thanks! Cristina - I'm so glad you like them! 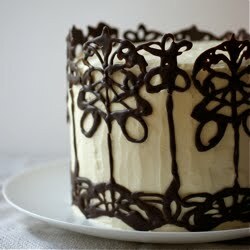 Especially after the swirls :) Great idea with the vanilla. hi emma your fork Biscuits are really tasty, and i really like the fork idea. Ma'am, you may have saved my relationship with these biscuits. Hi Emma, these look amazing. I'm going to make some cocoa, cinnamon and vanilla ones this afternoon. I was just wondering, can you could substitute peanut butter into this recipe as one of the flavours? If so, how much would you recommend using? Holly - Sorry it's taken me a few hours to reply, I hope it hasn't upset your plans. I'm not 100% sure about subbing in peanut butter, purely because it's got a lot of oil in it and I worry it'll change the texture. Perhaps you could take out a chunk of the butter and add a little more flour. Might be easier/more reliable to go for another recipe though (here's one of mine - http://www.poiresauchocolat.net/2010/02/peanut-butter-biscuits.html). That's okay Emma, I actually ended up making cocoa, malt and vanilla. Unfortunately they didn't work. I'm not exactly sure what happened, because I followed the recipe exactly, but most of the biscuits (even after cooling) crumbled to pieces at the slightest touch. I did manage to get a taste of the malt and I found them incredibly buttery and overly sweet. Not quite my kind of biscuit. But thank you for replying to my comment. I'm really sorry to hear you had troubles - I've made them tens and tens of times and never had an issue so I'm not sure where the crumbling problem came from. I'm also very big on things not being too sweet so I'm surprised you found them too sweet. I hope you find a biscuit recipe more to your taste - I'm sorry this wasn't it. My goodness! What amazing cookies. I made them just as you have them here, with vanilla, chocolate, and hot chocolate. I didn't have any issues with the recipe -- they turned out great without any modifications. They were gorgeous little cookies that were just perfect. Simple and lovely. Emma please trying these cookies. i am a itle confused. how small are the balls of dough? probably like 1 teaspoon or 1 tablespoon? mean a little lol . . .
Hello! Just made them. Delicious, despite the fact that I left them in the oven just a teeny bit too long while washing up! :-) Have you tried a peanut version? I'm dying to make peanut butter biscuits. So far all the recipes I've seen and made are American and the results have been soft, chewy cookies rather than biscuits. I'd like a peanut butter BISCUIT. Must experiment. Hi Ann - I'm glad you like them! I've never tried a peanut version of this recipe, but I do have a recipe for peanut butter biscuits that are crumbly and crisp rather than chewy here. There's also the roasted hazelnut butter biscuits, which I imagine you could adapt for peanut butter. Hope that helps. Hmm, that's a good question - I think I'd go for ball/fork/freeze, but I've never tried it myself. Do let me know how it goes if you try!